Forget fantasy. Forget magic. Forget dragons and bizarre creatures. 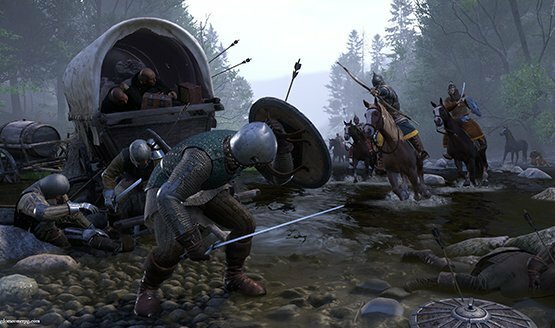 Kingdom Come: Deliverance might look a bit like Skyrim at a glance, but it’s far from being an Elder Scrolls clone. Kingdom Come is a massive RPG rooted in history and realism, both being central to the game design. The story of the lead is not that of the “chosen one,” but an ordinary man living in a moment in history. The setting is Bohemia in the year 1403. Though the main character Henry may not be plucked straight from history, every moment, character, and place around him is. Kingdom Come: Deliverance might as well be an interactive history book. The entire game is filled with history, a codex that is historically accurate detailing people, places, things, and events of the era. You don’t have to know history to enjoy the game, but it certainly offers a greater depth. One thing I kept hearing from the developers as they walked me through numerous parts of the game was that this game is slow. Kingdom Come is about dialog and discovery more than growing powerful and slaughtering anything that stands in your way. There is a combat system in place, a system of directional blocks and parries that accounts for types of weapons being wielded and what armor is being worn. Skills may be earned throughout the course of the game, but player skill that is gained over time is just as, if not more, important. The developers are quick to say that even the first enemy you fight in the game could just as easily kill you at the end. Combat will be tough, but exploring the world and having conversations can open up a lot of new options. With that in mind, why face down death when you could explore before a big fight and do things like burn all of the archers’ arrows or poison the camp’s food? Checking out the battlefield before the big skirmish to discover things like a pile of hay that can be burned to obscure the archers’ vision. Or maybe you just want to gear up in strong armor. Movement will be slower, and, depending on the helmet, your vision might be obscured, but you’ll be able to take more hits and fend off the tips of arrows fire from afar. One thing is certain, just running into the fray trying to smash everything wearing opposing colors is not going to be the best option. 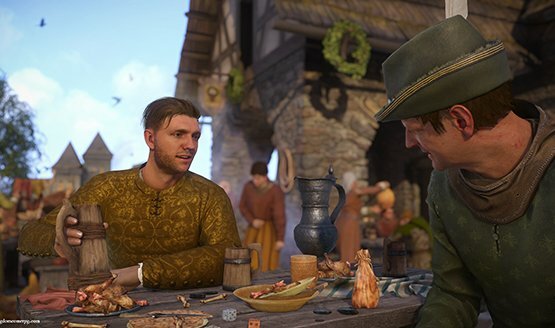 Kingdom Come: Deliverance isn’t designed to be something that you can throw short bursts into. Missions are designed to be long, and sometimes even longer than that depending on the choices you make and how you handle each situation. A daily cycle helps to create diversity throughout the game, including unique AIs and schedules for every single character. They will go about their lives and may not be where you need them to be. Every action will have consequences on the world, including the AI of the various characters. For example, if you steal the tools of a blacksmith, they’ll have to head into town to buy more and won’t work during the day. You can do pretty much anything you want, but you’ll have to live with the consequences which can make situations easier or more difficult, and open or close different quests or opportunities throughout the game. One such example came as Henry needed to infiltrate a circle of monks to weed out a killer among the new members. Being a monk, Henry is expected to stick to certain specific duties throughout the day, using only the small amounts of free time to figure out who the killer is. If he fails to follow the rules he may get kicked out and need to approach the situation from a different direction. He could confront the new members directly and immediately upon entering the brotherhood, or he could bide his time and investigate slowly but carefully. When you discover who the killer is, you could poison his food, or kill him while he’s sleeping, or talk to him and take a deal to escape. Once you’ve escaped, you can let him go his own way, or kill him right there where he stands. Conversation and politics can be just as damaging as swords and arrows. It’s virtually impossible to showcase the immense level of possibility that fills Kingdom Come: Deliverance, particularly in an hour. My PSX demo was a mere fraction There will be well over 100 hours of gameplay with the slower and more methodical style required, and no two players will have the same experience. Forget dragon shouts. Forget magic. Forget dragons and bizarre creatures. History is a fantasy playground and proves to be just as entertaining as magic-filled worlds with fictional stories. Kingdom Come Deliverance preview conducted at PlayStation Experience 2017.